The Ukrainian parliament has adopted amendments to state law allowing “admission of the armed forces of other states on the territory of Ukraine.” The possible hosting of foreign weapons of mass destruction is also mentioned in the documents. Amendments to Ukrainian law were adopted on Thursday by the Verkhovna Rada, receiving a majority of 240 votes (the required minimum being 226). The bill was submitted to the parliament in May by PM Arseny Yatsenyuk. It focuses on the provision of “international peacekeeping and security” assistance to Ukraine at its request. Peacekeeping missions are to be deployed “on the basis of decision of the UN and/or the EU,” the bill published on the parliament’s official website says. Previously, the presence of any international military forces on the territory of Ukraine not specifically sanctioned by state law was only possible by adopting a special law initiated by the president. Implementation of the new amendments “will create necessary conditions for deployment on the territory of Ukraine international peacekeeping and security” missions without the need for additional legal authorization, the explanatory note to the draft bill said. 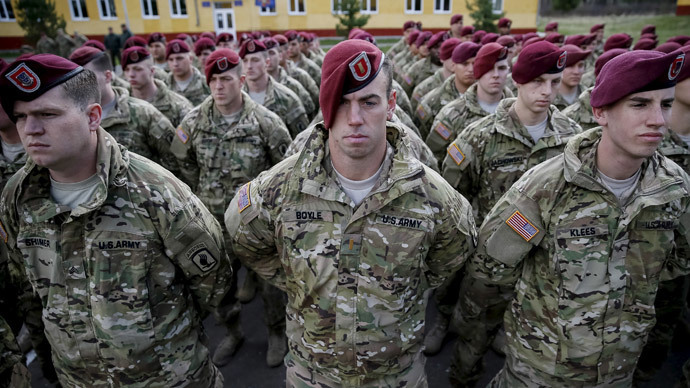 The presence of such armed forces in Ukraine “should ensure an early normalization of situation” in Donbass, the note added, saying that they would help “restore law and order and life, constitutional rights and freedoms of citizens” in the Donetsk and Lugansk regions. Implementation of the law “will not require additional expenditures from the State Budget of Ukraine,” its documents say. A separate amendment banned the presence of “armed forces of states that unleash military aggression against Ukraine.” This appears to be a clear reference to the Rada’s January statement calling Russia an “aggressor” – although the body has been reluctant to approve a legally binding law saying exactly that. Moscow denies being part of the conflict, stressing that Kiev is fighting a civil war with eastern Ukrainians, not Russian forces. The Kremlin has consistently and adamantly denied any presence of Russian troops or hardware in eastern Ukraine, pointing out that there is no evidence proving otherwise. With violence in south-eastern Ukraine on the rise again, it is “very important to avoid any actions or steps that provoke escalation of tension,” Kremlin spokesman Dmitry Peskov said on Thursday, as quoted by RIA Novosti. Saying that there is “no shortage” of provocative actions from Kiev’s side, Peskov said the main point is “to concentrate on implementation of [Minsk] agreements.”“This is what Moscow expects the most,” he added. The new bill on international peacekeeping missions in Ukraine contradicts the Minsk agreements, Russian State Duma MP Leonid Slutsky said. “Minsk-2 did not provide for peacekeepers in resolution of the national conflict,” Slutsky said, as quoted by TASS. The new legal act is “doomed for inaction,” a member of the Russian Duma’s defense committee, Franz Klintsevich, said, adding that the bill is “pure PR and propaganda.” “I cannot simulate a situation in which the United Nations will vote to deploy international military to Ukraine,” Klintsevich told journalists, as cited by RIA Novosti. The Lugansk People’s Republic’s envoy to the so-called Contact Group on Ukraine in Minsk, Vladislav Dainego, commented that the law was adopted to “justify the presence” of foreign military that are “already operating in Ukraine.” “There are some 20,000 [troops], primarily from Hungary and Poland,” Dainego claimed when speaking to Interfax, adding that the status of those forces was unclear. Kiev came up with the initiative to employ peacekeeping missions in Donbass earlier this year. Moscow has insisted that deployment of such forces in Ukraine would be relevant only after all points of the Minsk agreement have been fully implemented, and only if both sides of the conflict – Kiev and the rebel republics – agree to the measure.